Who needs the Liberal Catholic Church? We’re an independent and self-governing body - neither Roman Catholic nor Protestant – but Catholic. We trace our apostolic succession to the Old Catholic Church of Holland, through a complete reorganization in 1916 of the Old Catholic movement in Great Britain. Today, the Liberal Catholic Church combines the traditional sacramental form of worship – stately ritual, deep mysticism, an abiding witness to the reality of sacramental grace – with the widest measure of intellectual liberty and respect for the individual conscience. The Liberal Catholic Church is a modern Christian denomination; we believe that religion should keep pace with the best in human growth and enlightenment. 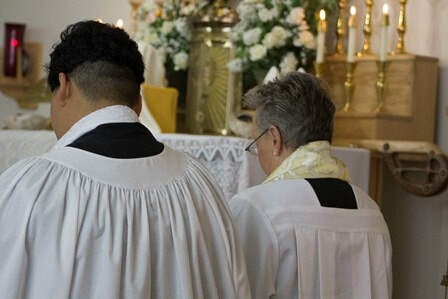 The Liberal Catholic Church is also traditional; we believe that, through administering Catholic sacraments to all, we continue to be stewards of a precious heritage handed down from Christ Himself. We use the Liturgy that was written and compiled by our Founding Bishops – the first edition of which came out in 1919. We, like the rest of the LCCI are governed by the Episcopal Synod, headed by The Presiding Bishop. Priests vow to adhere to the Codes and Canons of the Denomination. The Archbishop Charles W Finn Theological Seminary was established in 1923 and runs a 2 year course of study for those seeking ordination.